Sometimes the simplest, most unassuming food is the very best kind. I can’t imagine ever getting tired of a really good Bacon, Lettuce, and Tomato sandwich and some days it’s exactly the kind of food I most want to eat. 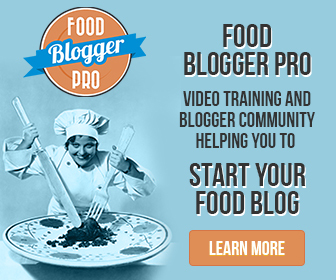 The thing about simple food is that every ingredient matters. To make a great BLT sandwich, it’s important to not skimp on any of the components. Get the best quality, thick cut bacon you can find, the ripest tomatoes, and crisp iceberg lettuce. And, the bread… the bread can be whatever kind you like, but make sure it’s a good quality rustic, crusty loaf. None of that tasteless white sandwich bread that is so flimsy your whole sandwich will fall apart after the first bite. 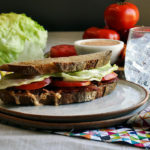 I adore this simple sauce on my BLT sandwich. It’s slightly sweet, savory, smoky, and creamy, and is the perfect complement to the salty bacon. 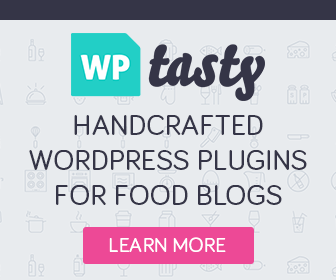 It’s delicious, but also optional. 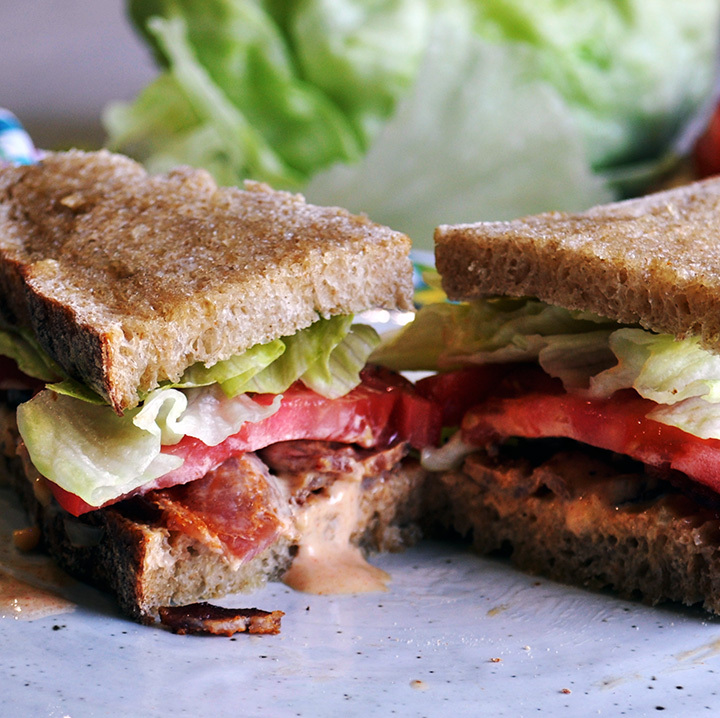 It’s perfectly acceptable to use regular ol’ mayo in your BLT sandwich instead. Heat a skillet over medium heat until warm. Add a few slices of bacon and cook until crisp on both sides. Remove to a paper towel lined plate to drain while you cook the rest of the bacon. Toast the slices of bread, buttering the outside of the slices. Buttering the bread is optional. 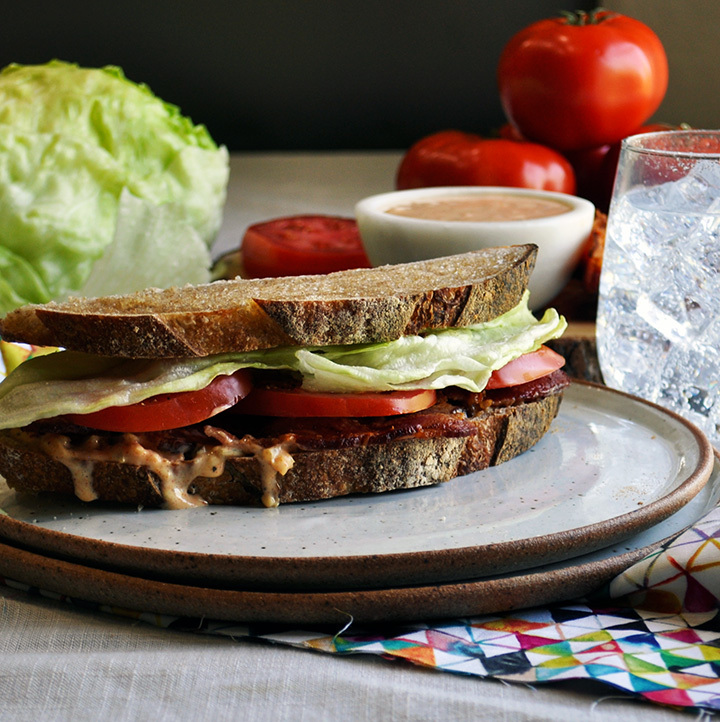 Assemble the sandwiches: spread one slice of bread with a generous amount of BLT sauce. Lay a couple slices of bacon over the sauce, top with a slice or two of tomato and a few pieces of lettuce. Top with another piece of toasted bread and serve.